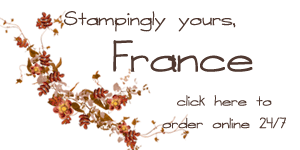 Quick update from last week Stampin’101 with the Clear Stamp to stick on your acrylic block. “The stamping lady” left a comment on how she use the ‘clear table plastic” on her clear block to hold her stamp in place well long story short I heard of that before but with negative respond well I decided to try it and Voila! you have it in the video on my blog at www.frenchiestamps.com . The big tip for this is to use the light plastic. My friend that try it and told me it is not working they were using the heavy plastic so if you choose to go this route make sure is the light “green paper” that the plastic come in the roll. You will see in the video what I’m talking about for the plastic it’s almost like a clink. To be honest I like the 2-way glue better cause it is stay stronger but this work better then nothing. So if the 2-way glue was not for you try this method maybe this will be the perfect way for YOU. Again thank you to “the stamping lady” that share the comment. Now about the card today it’s nothing to do with this Clear Block and clear stamp but perfect timing to share a card that was in my mail box this weekend. The Flower Shop stamp with the Scalloped Tag Topper Punch how fun is this card, thanks Holly. Well my friends will be back tomorrow and update you where my daughter and I will be spending the next few days. Flying standby we never know where we will find seat available so this time wherever we can find open seat that go south we’ll try to hop on. 🙂 We’re in for a adventure…..
Stay tune and have a great day. Yesterday was the new deal of the week CLICK HERE to shop or to see close up the deal for this week. Remember still sale a bration for every 50.00 before tax and shipping you get a free sale a bration and YES the deal of the week count for the 50. Any question please contact me. Thank YOU for your business!